Pope Francis has established a new Diocese for Kumba, covering Meme, Ndian and parts of Kupe-Muanenguba Divisions in the Southwest Region. The new Diocese will be led by Mgr. Agapitus Enuyehnyoh Nfon, formerly Auxiliary Bishop of the Bamenda Archdiocese. The information was officially made public at the Sacred Heart Parish Fiango, Kumba, on Tuesday, March 15, by the Apostolic Nuncio to Cameroon and Equatorial Guinea, Piero Pioppo. Speaking at the special meeting attended by Catholic faithful and hundreds of Priests, the Apostolic Nuncio read out a circular letter containing the new developments within the Church. According to the letter, a copy of which The Post procured, the appointment of Nfon Agapitus was already confirmed on February 14, 2016, but had to be made public at midday of Match 15 as per the prescriptions of the Holy See. The letter reads that, “After our confidential talks, I am glad to confirm to you that his Holiness Pope Francis has established the new Diocese of Kumba whose territory, divided from Buea Diocese, will extend on 11.43Km2 including the Departments of Meme, Ndian and parts of Kupe-Muanenguba”. Piero’s letter further states that, the Holy Father has nominated Mgr. Agapitus Enyuyehnyoh Nfon, presently Auxiliary Bishop of Bamenda Archdiocese, to head the new Diocese. The Apostolic Nuncio expressed gratitude to the Diocese of Buea, whose maturity in faith and service to God allowed the creation of the Kumba Diocese. Piero Pioppo wished the new local Church of Kumba, its Bishop, Priests, Religious Men and Women every Grace from Christ the Good Shepard. The letter, which is copied to the Bishop of Buea, His Lordship Mgr. Immanuel Bushu, sanctions the expectations of many a Catholic Christian within Kumba that had longed for a separate Diocese. People in his native land, Noni, according to reports, received the news with euphoria. They said they are fervently praying that he will overcome the challenges of a new Bishop. Mgr. Agapitus Enuyehnyoh (who is God?) Nfon hails from Noni in Bui Division of the Northwest Region. The 52-year-old pioneer Bishop of the Kumba Diocese was born on February 11, 1964 at Shisong, Kumbo. Agapitus studied at the Bishop Rogan Minor Seminary in Soppo-Buea and later progressed to the St. Thomas Aquinas Major Seminary in Bambui-Bamenda, where he studied Philosophy and Theology. On March 22, 1991, Mgr. Nfon was ordained Priest by Mgr. Cornelius Fontem Esua the then Bishop of Kumbo. Between March and July 1991, Agapitus served as assistant Parish Priest at Sop’s Parish. He also served as Vicar at the Kumbo Cathedral and Principal of Catholic School Annex Kumbo, between July 1991 and July 1992. He occupied the position of Chaplain and teacher at the Saint Augustine College Kumbo from July 1992 to July 1993. Agapitus was Parish Priest at St .Pius X Parish in Tatum from July 1993 to July 1994. Secretary of the Bishop (July 1994 – July 1995), Diocesan Treasurer (July 1995 – July 1996), Principal of St. Augustine College Kumbo and Chaplain of the Catholic Women Association (July 1996 – August 1998). Agapitus will, between 1998 to 2001, study for superior courses in Rome where he earned a License in Patristic Theology. By 2001, he joined the Staff of St. Thomas Aquinas Major Seminary. Between 2004 and 2005, he was treasurer and later on in 2005 became its Rector. 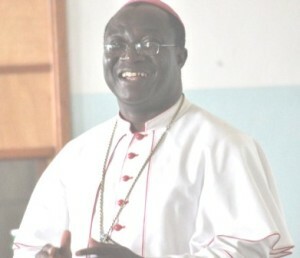 On April 2, 2011, Agapitus was appointed Auxiliary Bishop of Bamenda, where he has been until the March 15 decision from the Holy Father appointing him pioneer Bishop of the Kumba Diocese.